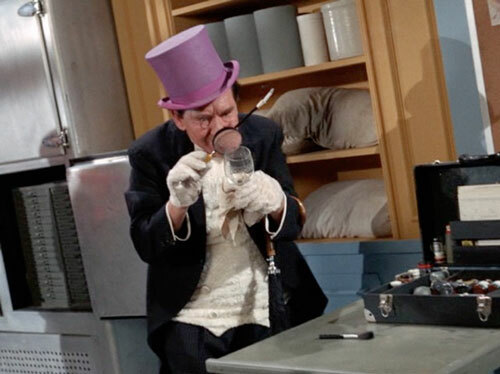 In December 1966, the “Penguin’s Nest” arc was finally broadcast. But it was the first season two arc to be shot; why the delay? We also discuss the 1946 comic book version of this story; Lorenzo Semple’s gift for making humor from situations, rather than the goofy jokes added by some other Bat-writers; the majesty of Burgess Meredith as the Penguin; and a swaggering Batman who gets taken down a peg. This arc marks the show’s being bestowed a high honor in sixties TV: The Vito Scotti seal of approval! Also, the Who’s version of the Batman theme, and updates on our collection of Bat-theme covers and… hey, look, it’s Jay Thompson’s first-draft script that eventually became “The Impractical Joker”!